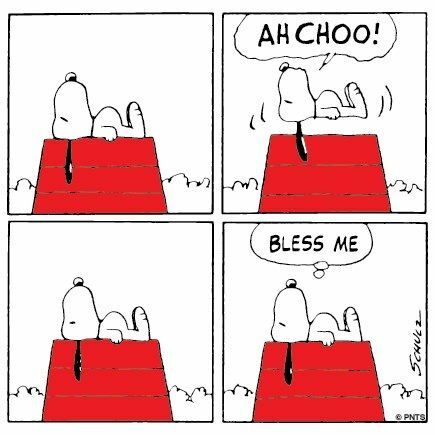 Sneezing, also known as sternutation, is the response of the mucous membrane of the nose to an irritant or foreign body that causes allergy in a hypersensitive person. A sneeze is an involuntary explosive burst of air from the nose and mouth that removes offending material from the nasal passages. Sneezing can occur from a number of causes, or may itself be a symptom of an underlying condition, most likely an allergy or common cold. Sneezing may simply be triggered by a small foreign object or substance in the nose, including particles of pepper, smoke, irritating chemical fumes, or gases. It may also be a symptom of a common cold, upper respiratory tract infection, hay fever, or other allergies to pollen, dust, dust mites, mold, dander, grass, or other substances. Additional potential causes of sneezing include withdrawal from opiate drugs, inhaling corticosteroids, whooping cough, or anaphylaxis. Many people sneeze when they step outdoors into bright sunlight. Others report sneezing whenever they tweeze their eyebrows. In a January 2000 paper in the journal Neurology, Dr. Mark Hersch of Australia’s New South Wales University reported that some stroke patients find themselves temporarily unable to sneeze, leading to speculation that a “sneeze center” may exist in the medulla of the brainstem. An attempt to determine the cause of sneezing is likely to include an examination of the upper respiratory tract. A doctor might perform skin tests to uncover any allergies, or antibody tests. In some cases, x rays are also useful. Echinacea , Yin Chiao Chieh Tu Pien (a Chinese over-the-counter formulation), zinc, and vitamin C are all potentially useful against sneezing and other cold symptoms. Stinging nettle (Urtica dioica) and red clover (Trifolium pratense) may be used for allergies. Either of these disciplines may offer individualized relief. A local practitioner should be consulted. Homeopathic remedies may include Allium cepa, Sabadilla , Nux vomica, Euphrasia , Natrum muriaticum, and others. Acupressure points that may be effective against sneezing include Large Intestine 4 (between the thumb and the index finger), Governing Vessel 26 (on the upper lip), and Triple Warmer 5 (on the forearm). Some hay fever sufferers report benefits from hot baths, massage, and other relaxation therapies. This most commonly consists of over-the-counter antihistamines . Although these drugs often result in drowsiness, newer versions including Allegra and Claritin do not cause that problem. Other treatment options may include an allergen-free diet, or a series of allergy shots, injecting increased amounts of an allergen to desensitize the body. Most commonly, sneezing is a mild and temporary problem. In those cases in which medical intervention is needed, the results are usually favorable, although allergy patients sometimes develop asthma. 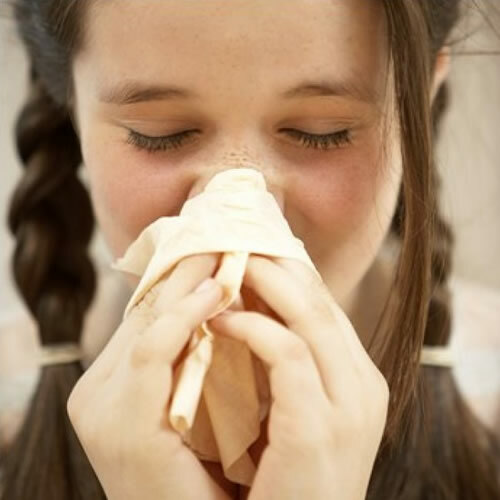 With allergies, the best way to prevent sneezing is to avoid exposure to allergens, the substances that provoke allergic attacks. Depending on the substance, this can be done by timely replacement of furnace filters, removing animals from the house, or even getting out of town during particularly sensitive seasons. Handwashing and careful hygiene are good ways to avoid common colds and other infections.